Laserfiche is a market leader in enterprise content management and process automation. Forty-five percent of the company is the product development organization. In product development alone they had about 14% year-over-year growth last year, with three main development centers in three different countries (US, Canada, China). Currently, Laserfiche is focused on how to accelerate how business gets done by creating software that people love to use. I spoke with two enlightened executives, Linda Ding and Greg Eisenberg. They walked me through the company from a structural and business perspective, and showed me how Laserfiche is leveraging smart research and development with strategic business planning to reach the pinnacle of success. Greg Eisenberg is a veteran software developer and manager who holds a bachelor’s degree in computer science from McGill University. He started his career at Microsoft where he held several roles including Program Manager and Lead Software Engineer on various B2C, B2B, Server, Desktop, Web and Mobile products. Greg finished his time at Microsoft managing the team which created the email application on Windows Phone. Greg spent over 3-years as the Director of Software and Firmware for eSolar managing several teams which built a solar collector system comprised of thousands of powered mirrors, heliostats, which collected heat to create electricity or desalinize water. Greg has been with Laserfiche for over two years; he is currently working on improving software development and product-management processes and helps lead an organization of software teams across multiple time zones. Linda Ding received a dual bachelors in economics and cognitive science from the University of California, Berkeley. Prior to joining Laserfiche, she worked as a market researcher and as a consultant for organizational training and development. Over the past 12 years, Linda has worked her way up to director of strategic marketing at Laserfiche. In 2017, she was named a “Rising Fintech Star” by PR News and “Ten to Watch” by WealthManagement.com. 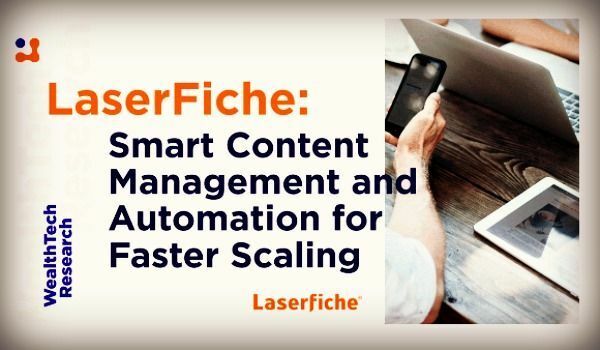 In an executive advisory survey, Laserfiche clients were asked, “What is Laserfiche to you?” The responses ranged from Laserfiche being their “Swiss Army knife” to “the glue that holds their organization together.” Essentially, the platform is the operational backbone to many wealth-management firms. Greg said that every client they have has some existing digital ecosystem they operate in. Laserfiche serves as the conduit to transcend all business operations, including compliance, onboarding, making sure all fiduciary responsibilities are met, HR problems, etc. Laserfiche streamlines workflows by automating processes like data validation, separation of data, transferring data to third-party systems, as well as archiving transactions. Integrations are a major part of Laserfiche’s business model. Greg highlighted that they allow third parties to integrate with Laserfiche using their SDK, and their Professional Services teams or Solution Providers can build integrations for their customers and their existing ecosystems. These integrations can be custom built to suit the customers’ needs. Greg said that they have two major initiatives in the integration space: robotic process automation (RPA) and no-code activity-based integrations. Robotic process automation is a model that doesn’t require a developer. 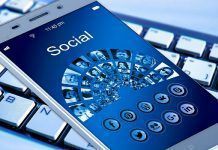 Instead, it enables a knowledge worker who knows system A and system B to record their interactions and add those interactions to the automated workflow. No-code integrations are a way for someone with no coding skills to configure the integration between Laserfiche and a third-party system. The customer can then add that integration to their workflow. The Laserfiche platform is a way for companies and firms to eliminate the need for paper documents. Linda outlined that through smart data-collection tools, Laserfiche workflows that take minutes instead of months to complete can be triggered. This type of improved efficiency could allow an advisory firm to scale faster and transform their business on a fundamental level. For FinTech, this means that advisors can streamline account opening, onboarding, reporting, and analytics. Laserfiche can help them replace dozens of paper forms and hours of document filing down to minutes, all while keeping in line with compliance and audit reporting. There are some obvious, but sometimes overlooked, elements a FinTech product needs to have. One of those elements is compliance requirements. Linda said that Laserfiche is the only member in the wealth management space that has a records management module which can be used in compliance of the Department of Defense, DoD 5015.2, for long-term archiving and retention of digital records. This level of compliance is the international gold standard in protecting the integrity and security of digital records. Laserfiche’s on-premises product can also be used in compliance with SEC Rule SEC17a-4. Greg said that it is a two-way street when it comes to on-premises security implementation. The Laserfiche platform contains all the tools and functionalities to secure data, but it’s up to the customer to make sure these controls are in place. A big announcement Linda shared with me was that Laserfiche will soon launch LF Vault, an SEC 17a-4 compliant storage solution in Laserfiche Cloud. This feature will allow customers to securely manage their digital content directly in Laserfiche Cloud, with no hardware required. As Laserfiche moves to the cloud they have gained a SOC 2 compliance certification, which ensures that Laserfiche follows strict information security policies and procedures to ensure the security, availability, processing, integrity, and confidentiality of customer data. Laserfiche also uses a third-party security firm to analyze their code base to identify potential vulnerabilities and perform penetration testing of the Laserfiche cloud. Laserfiche hosts an annual conference called Empower. This year, 3,400 people from over 1,100 different organizations from 37 countries attended the conference. The Empower conference is a great opportunity for Laserfiche product managers, developers, and testers to hear what customers want, what they need, and what’s working for them. Empower consists of over 250 classes, training courses, and hands-on labs taught by Laserfiche employees, customers and partners. Thirty percent of the classes are taught by Laserfiche customers, who share their own case studies and experiences with colleagues. Beyond hosting conferences and meetups, Laserfiche’s sales, presales, and marketing teams gather feedback and use cases, and product-management and product-development teams then go through the processes of prototyping and user-testing various solutions to customer issues and needs. Linda explained that because Laserfiche is used across a multitude of industries, including financial services, education, and government, they have a broad overview of business as a whole. Laserfiche invests in building institutional knowledge by doing primary and secondary market research, putting together focus groups, and taking industry surveys to keep close tabs on what the current trends are, as well as the demand gaps in the industry. Linda mentioned that they have a solution division that is specifically focused on designing and creating the latest solutions from industry demands. Laserfiche’s on-premises offerings run on Windows Server and was written in different languages, from C++ to C#. Greg explained that as the company moves to the cloud, they need to identify the smartest technology to handle the problem the best way. Linda said that Laserfiche and its solution partners back a robust professional services network that ensures a near 24/7 troubleshooting, solution and feature design, and support for wealth-management firms on a local level. Laserfiche’s software-development teams are primarily Agile and generally follow the Scrum methodology. The company has dozens of software teams in three different locations—Long Beach, USA; Toronto, Canada; and Shanghai, China. Greg mentioned that Scrum is not a requirement, so some teams utilize Kanban more than Scrum. Every Wednesday, the entire development team meets with the sales and marketing teams to demo the new features and projects that are in the works. As Greg told me, these demos can range from a “seed of an idea” to something that is close to release. This meeting of minds is a wonderful opportunity to get feedback on all stages of development. Laserfiche has been around the block and back when it comes to enterprise content management and process automation. Over its 30+ year history as a company, Laserfiche has been an innovative force across many industries, FinTech being just one of them. Their strategic outlook is refreshing and implies a deep understanding of the internal workings of industries. 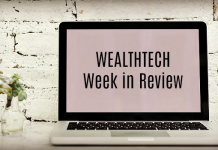 The move to the cloud will be a major step in increasing the reach of the product in the market, and is why Laserfiche has won the Document Management solution of the year by WealthManagement.com three times and is named by Wall Street Journal one of the essential technology tools for financial advisors. Next articleGuest Post: Is The Business World Well Placed for New Technology?